Description: regular sd40, 4607 is leading the 242 and 738 up the hill to the acca engine shops this afternoon. 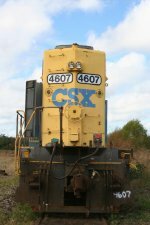 Description: CSX 4607, an unrebuilt SD40 and CSX 2495 are on the lead of a ballast train at Skippers, Va. Description: A westbound ballast train temporarily clears the main for the passage of three trains. Description: An unrebuilt SD40 brings a ballast train to Cartersville. Description: The ballast train is now parked in the Southbound track at North Junta. Description: A loaded Stilesboro coal train passes the ballast train at North Junta. Description: Today we have 2 of CSXs 5 SD40s including CSX 4617 still in C&O scheme! Description: This SD40 was leading a Herzog. Description: CSXT Southbound Ballast Train W089 getting ready for departure in #1 East Yard at Boyles Terminal in Tarrant City, Al. Description: CSXT Southbound Ballast Train W089 passing through 24th Street Interlocking in Birmingham, Al.